I haven't had this stuff since July. Back then, I got to sample it twice: the first time was when I was at a "Christmas in July" shindig during Ohio Brew Week; the second was a night later, at another OBW bar. Spoilers: I love this stuff. You may have gleaned that from this blog if you've read either of the posts linked above. Although I have an affinity for the ale, there is something I haven't been able to do with it yet: give it a proper John Likes Beer review. Today, on my favorite holiday, I hope to share that treatment of it with all of you. Call it a present, if you'd like. I don't really know a lot about Thirsty Dog itself. The About Us page on their website keeps their story short and sweet. They're based out of Akron, Ohio. They pick the best ingredients for their beers. They're nationally recognized due to the quality of their unique brews. Honestly, they seem like a brewing company the likes to let their beers do the talking for them. Luckily, that's exactly what their beers do. As far as 12 Dogs goes, the page for the ale informs that: it's made with caramel malts; contains hints of honey, ginger, nutmeg, and cinnamon; and is available November first through Christmas day (although, I know from experience that you can find it out of season--you just have to look hard enough). What do I think of the brew? Well, first off, 12 Dogs smells like Christmas. My parents used to burn incense around this time of year (my mom had a snowman-shaped incense burner that she'd always pull out). This smells exactly like that. For me, this ale is Christmas at home with my family. A very spicy aroma, with just a hint of honey tucked beneath the surface. Purrl, who would not sit still for a picture with my bottle, only gave it 3 whiffs. Don't mind her. This smells great. And, believe it or not, it tastes just as good as it smells. It's a sharp flavor--there's a lot of bite to this brew. There's nutmeg--front and center--which is closely followed by the ale's other spices (ginger and cinnamon). It has a nice roasted kick, thanks to it's roasted caramel malts. The honey is prevalent in the aftertaste and in the aftertaste alone. It serves to compliment the beer, not to be its star player. 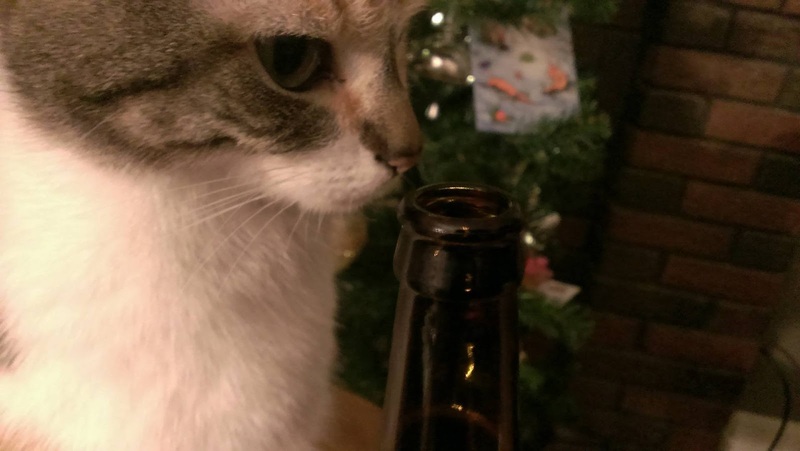 This is a very fizzy brew, with a mouthfeel that matches the bite of it flavor. It's not so carbonated that I'd call it chewy, but its carbonation is definitely a selling point. I've already, briefly, discussed my mom's snowman incense burner. But, when I drink this beer, I can picture it vividly in my mind. Well, as vividly as I can without remembering exactly what colors go where. I know the colors it showcased: green, red, white, and black. Comprised totally of wood, it had a flat bottom (which I remember as being green), and two rounded body segments under its head. It had a top hat (I'm pretty sure this was red) and a pipe, which was where the incense smoke came out. That burner is exactly what this ale reminds me of. 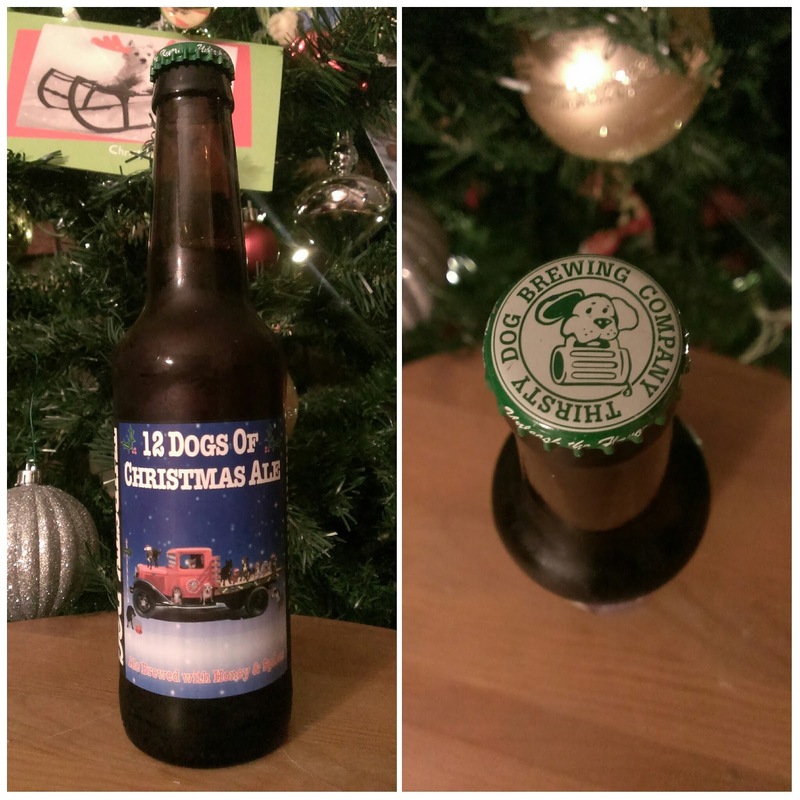 Thirsty Dog's 12 Dogs of Christmas is fantastic. It is hands-down my favorite Christmas ale (although, I'm constantly hoping I'll try one that I like more!). As such, I give it the highest recommendation I'm able: a 10/10. Try it! But, do so slowly. It's 8.3% ABV can definitely sneak up on you (as it just did me).